As the national economic development sponsor for ACCE, the Market Street team always looks forward to early August and the chance to reconnect with friends and clients from around the country. This year’s annual conference is in Savannah, Georgia, a city that is near and dear to me personally. My hometown, Brunswick, is an hour south from the community that some still call “the Hostess City of the South.” I have many family and friends there, and I wrote my Georgia Tech City Planning school entrance essay about General Oglethorpe’s plan for the city, which created the many beautiful squares that are enjoyed by residents and tourists alike. With more than 1,000 Chamber professionals in Savannah for the week, there have been plenty of opportunities to enjoy the city and learn from its history. As always, ACCE works hard to integrate the host city with the conference agenda without distracting from the valuable workshops, think tanks, keynote presentations, and committee meetings that are scheduled throughout the week. Based on reports from the Market Street team (we have five staff members in attendance) and the social media coverage of the week, this year’s conference has once again provided quality networking opportunities, genuine learning and sharing, and inspiration. The vitality of the Chamber profession is evident everywhere you look during the conference, from the First Time Attendee gathering to the recognition of new Life Member honorees. The annual Certified Chamber Executive (CCE) breakfast was once again very well-attended and thought-provoking, as three very experienced Chamber professionals (Harvey Schmitt, Raymond Burns, and Kit Cramer) discussed the legacy of their work. Our CEO, Mac Holladay, moderated the panel following the recognition of the seven new CCEs. This year the conference featured seven tracks – Leadership; Membership/Revenue/Events; Marketing/Communications; Economic/Community Development; Public Policy/Government Relations; Education/Workforce; and Diversity & Inclusion. Next week’s blog posting will feature more takeaways from various sessions – in the meantime, we want to thank Mac’s guest panelist’s for yesterday’s standing-room-only session on “Inclusive Growth: Policy, Programs, and Progress.” Bob Morgan, President and CEO of the Charlotte Chamber and Courtney Ross, Chief Economic Development Officer for the Nashville Area Chamber were gracious with their time and engaged the attendees. We’re looking forward to Market Street VP Matt Tarleton’s afternoon session on “Attracting and Keeping Millennial Talent,” which will also feature Kate Atwood from the Metro Atlanta Chamber; Shannon Full from the Fox Cities Chamber; and Shannon Hoeg, Chair of the South Shore Chamber’s Young Professionals group. And finally, I have to give a huge shout out to the ACCE team for expanding the conference app features (with partners at The DoubleDutch Team). For the first time in nearly a decade, I was unable to attend the conference at the last minute. I had already downloaded the app and began using it before my plans were cancelled, so I’ve kept it close all week to follow from afar. While a lot of session highlights are being shared on Twitter, the conference app has a much more personal feel. Chamber professionals have embraced the app this year, posting photos, key takeaways, and using it to connect with their colleagues from around the country. It also seemed to help fight off the boredom experienced by many during travel delays earlier this week (thank goodness Delta is getting back to normal!). Even though the app is intended for actual conference attendees, not “observers” like me, I think my app usage and experience reinforces the value of online learning and social networking. In this case, it’s a consolation activity that is helping offset the fact that I can’t be there in person, but there are plenty of chamber professionals who simply can’t accommodate the days away for scheduling or resources reasons. For anyone out there reading and wondering if they should download the app… it’s not too late to follow along with ACCE. Maybe next year there will be a new category of “virtual attendees” along with the 1,000+ actual attendees! Check out convention.acce.org for more. Hard to believe, but students around the country will be heading back to school soon. In many communities, teachers and administrators are already deep into their planning work and preparing for the coming academic year. To celebrate this annual transition, we’re highlighting a few best practices and issues as we reflect on the critical connection between education and economic development. 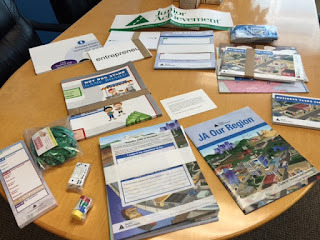 In a blog post earlier this year, I shared information about a good resource for hands-on learning at the elementary school level, sponsored by Junior Achievement (JA), an organization that has been around for 97 years and has a global reach. Later in the spring I also participated in the “JA Day” at my daughter’s school, which was similar to the program described here. The morning session provided students with the opportunity to learn key business and economic concepts from business community volunteers (who are also often parents). JA provides all of the materials (featured in the photo below), but the volunteers are empowered to deliver the curriculum directly, with only classroom management support from the teacher. The experience is rewarding for volunteers and a treat for the students. Teachers have some time to spend on planning, and the school strengthens its relationship with the community. And for those of us with no teaching experience, working with a class of 20 elementary school students was an intense experience. Many schools have guest reader or Principal for a Day programs – which help connect students to business representatives and role models. Those programs give participants a glimpse into the challenges and opportunities that come with public education as well. But if you’d really like to understand the job of a teacher, you literally need to walk a mile in their shoes. Four hours in the classroom only scratches the surface of course, but if you would like to help your community leaders understand some of the educational issues in your schools, developing a partnership with JA might start some great conversations. One of our client communities in Alabama (Decatur-Morgan County) has been having some fascinating dialogues about education and workforce training for more than a decade, thanks to the launch of the Summer Welding & Electrical Technology (SWeETy) Camp for 9th – 12th grade young ladies from local schools. Hosted by the Decatur-Morgan County Chamber of Commerce and education partners, the camp’s goal is to offer young women an opportunity to learn hands-on about technical skills that can lead to high-paying, satisfying careers in high growth industries. Not far away, in Carroll County, Georgia, one of the community’s business leaders, Southwire, developed the cooperative 12 for Life program with the school system in 2007. The program is intended to provide “students a place where they can mix classroom time with time on the floor at a real manufacturing plant, gaining an education, a paycheck, key work and life skills, and the all-important hope—for a diploma, for success in the workplace, and for a better life.” 12 for Life has received national media attention and continues to maintain a focused approach to the initial goals of 2007. My colleague, Ranada Robinson has shared many other best practices and updates from education field, including takeaways from the 2015 Associated Builders and Contractors, Inc. (ABC) Workforce Week Conference, where she presented this past March, and a webinar that shared research regarding school takeovers by state governments. Stay tuned for more updates about education best practices, trends, and issues that could impact your community. As August beings, we wish the best to our communities as they transition back into the school year, and look forward to featuring some of the businesses and community leaders that are making education a priority and strengthening the economic and workforce development partnerships that are vital to success.